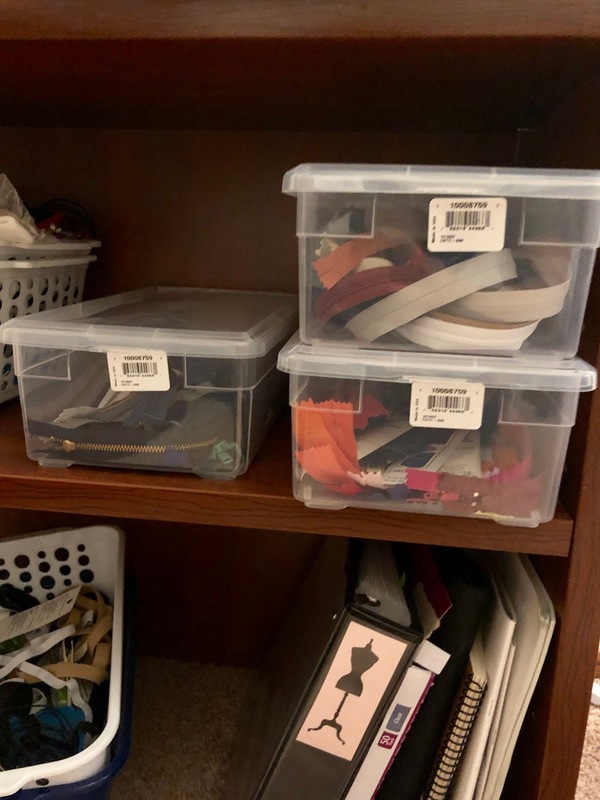 I have kept my zipper stash in ziplock baggies, loosely separated by type, and in these plastic baskets I got from Dollar Tree. 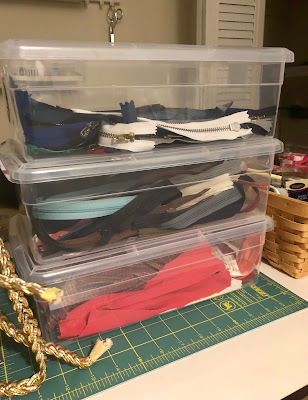 I have my trims in a basket, elastic in another, and all my interfacing is folded and in ziplock bags. I went to The Container Store to buy a tote to keep my Indie patterns in so I could free the 4th drawer in my pattern file cabinets. Checking out, I spotted these clear shoe baskets (whose shoes can fit in these??) and they were only $1.69 plus I had a 15% off coupon...JACKPOT! I should have gotten more but I was just thinking of zipper storage at the time. And now I need MORE!!!! Lol! They will stack perfectly on my bookshelf! I may use the Cricut to label them. Now they're separated by regular zippers, invisible zippers and fashion zippers. I need one more for jacket zippers. My NL6123 dress is right at the finish line. 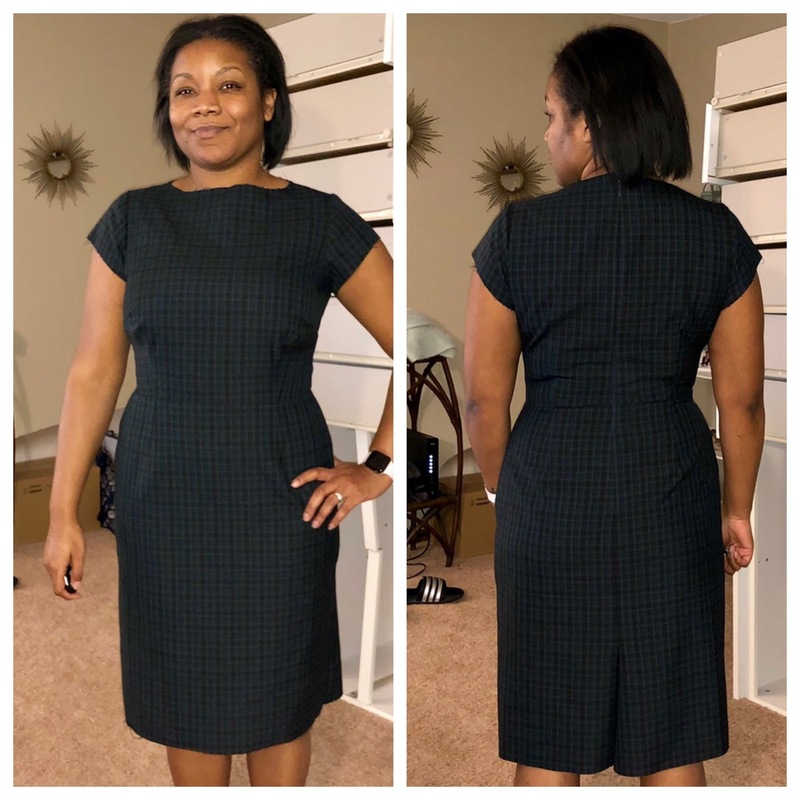 I've only sewn a lined dress with vent once and had to do some research before finishing. I know I used Colleen G. Lea's vid last time but this time it seemed confusing. Could be that I was just tired. Hopefully I'll get that finished this week. This is the fabric I bought for my husband's blazer (it feels amazing!). It arrived and was much more green than gray. Behold my terrible in-progress pics :) The side seams were basted here (I ended up letting the hip out a little). I'll dish about my dart issue when I review. The blazer is coming along too. I'm not sure why I chose two labor intensive projects to work on at the same time. DOH!! The lining is cut and ready to be assembled. I'm not going to bag the lining; I am going to go ahead and hand sew it like the pattern instructs. The sleeve vents are constructed like actual vents...but then the buttons are just sewn on through all thickness. I'm going to go through all this trouble and not go all the way? Pfft. This jacket, except for the collar style, is *exactly* like one of my J. Crew blazers. front darts, armhole princess seams, where the welts are positioned...I'm using it as reference. Anyway, I interface a piece of the suiting and make sample buttonholes. Decide the first one was too narrow and the second one was good! 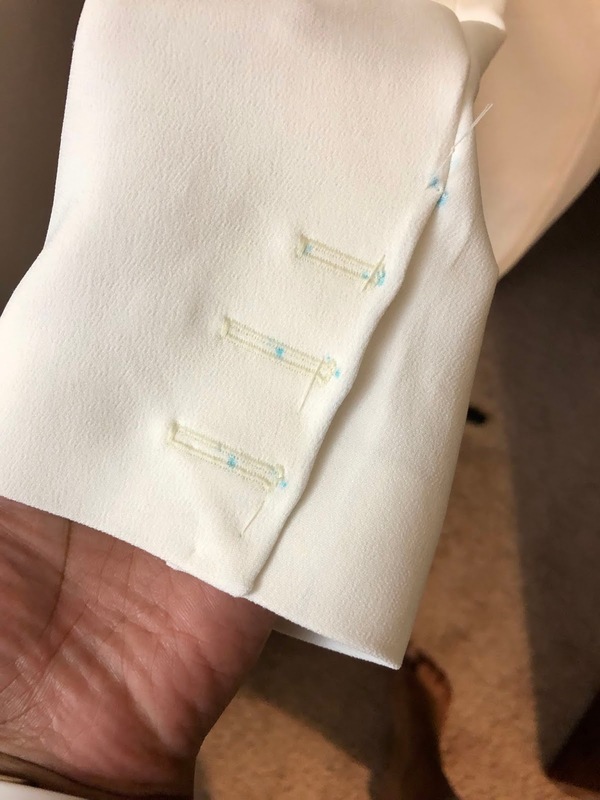 In true sewing headache fashion...I have 5 perfect buttonholes and 1 that I don't even know. The FIRST buttonhole I made after the sample is like 2/3 the length it needs to be. I have NO idea what happened. Nothing was changed between making the samples and making the buttonholes. nothing was changed from the first buttonhole to any of the others. It's a mystery!!! My edges are wavy because I had constructed the vent area before realizing it wasn't real. I'm not sure why the lack of instruction to interface didn't tip me off...but I added interfacing after the fact which means that edge isn't interfaced. Not ideal but, sometimes you do what you gotta do! 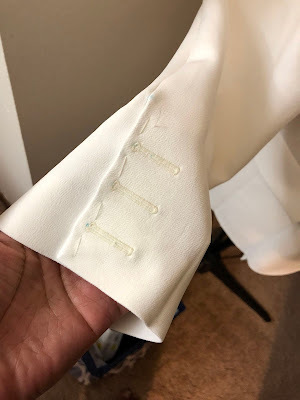 I will likely not get my husband's blazer done before surgery. It'll be a good fall item! I think I'm going to make a tops from M7722 and V8597 right away. I need a couple easy projects with these two that are in progress! You always work out what you need from the store when you get home...you never see the need at the time. It's a pain but seems to be the way! Yes, agree, that lining and finishing does seem to dra..gg...ggg on. I love your flexibility to adversity in your sewing. It keeps me feeling in good company (the adversity). Thanks for showing the bumps in the road along with the glad happenings. I love your style in clothes too. 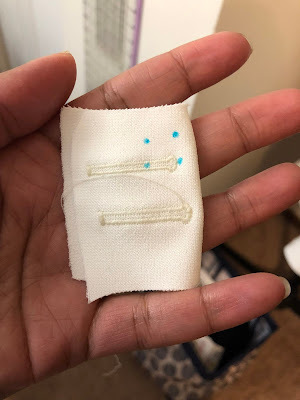 Dont lose your mind with this surgery and not being able to sew. You're kindly kept in all our prayers. Perhaps start a book list to keep you busy while you heal? My life would be totally out of control without plastic shoe boxes! I love how they stack and you can never have too many. The dress is really cute and why are BHs so damn frustrating, ugh? I feel your pain. 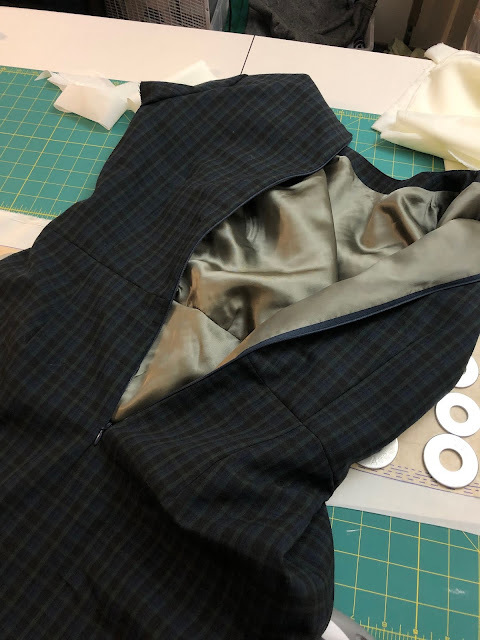 Haha, I have a jacket at almost exactly the same stage of construction and am really dragging my feet over doing the final, boring finishes to it, so much so that I've cut out something else which is of course exactly how wips turn into ufos! 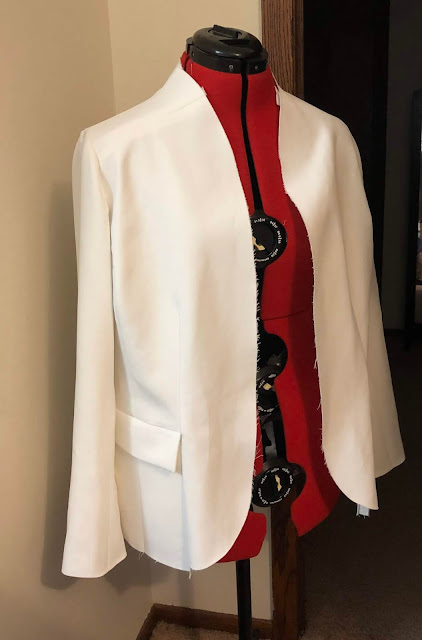 Your dress is looking great though and hopefully will inspire me to get the jacket done already!! I love that you have gotten so much done, and that everything looks really nice! The dress is going to be pretty! And you are right about two labor intensive projects at once...definitely tough. Wishing you the best for surgery! I like the almost completed dress, it looked good in the fitting process. Buttonholes *&^%!! !--- It seems your machine does what mine does, sews a few perfect buttonholes and then comes one that is way off from the right size and you know you did nothing different. The challenge is removing the stitches and hope you get it right the second time around.